We would like to take this opportunity to introduce you to Poolandspa.com, the World’s Oldest & Largest Pool & Spa Web Site with over 5000 pages of useful information, pictures, products and articles that are of interest to pool and hot tub spa buyers and owners. We have been involved in all aspects of the recreational water products and backyard industry since 1980. We have been on the Internet since 1994 – that’s practically the Stone Age in Internet years! We were one of the first companies to see the tremendous value of nationally marketing to consumers online. These days you can’t go anywhere without hearing about the Internet. More and more people are using the Web every day and are turning to it as a resource for information as well as a place to shop. But for advertisers, it’s like the Wild, Wild West out there – so many Web Sites, so many choices. Often, companies must spend money needlessly on Internet Advertising because it is so hard to target their particular demographic audience. That’s where we come in ! We have the customer's eyes that you want to reach ! If your company currently benefits from print, web, TV, and/or radio advertising direct to the high end consumer, then you will certainly benefit from an advertising program on our site ! 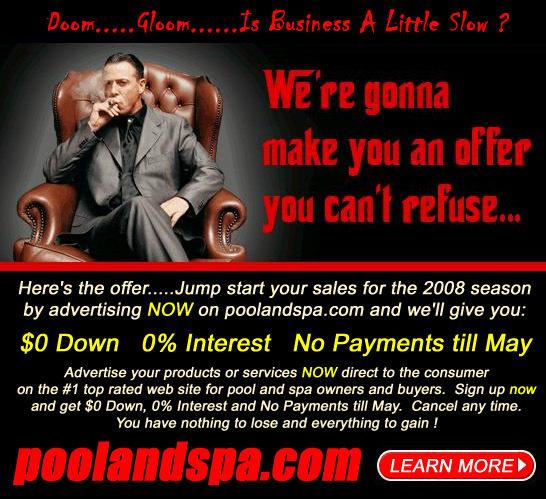 Poolandspa.com is of interest to a very select, high quality demographic group. Since we’ve been on the Internet for 15 years, our site is extensively linked to every major search engine on the Net – often appearing in the top 10 listings – making it very easy to find by pool & spa owners and buyers. Our site gets great national exposure with millions of visitors each year ! Switch to target marketing on Poolandspa.com. We hope that your company will join us on the Net – read on for more details ! For further information on any of our advertising packages, see details below or call 1-800-876-7647 or 1-702-437-4343. $5 / mo. $10 / mo. $500 / mo. $500 / mo. $249 / mo. Includes your company name, address, phone in our company & dealer locator search engine. Includes your company name, address, phone, web site, email and tags lines in our company & dealer locator search engine. Includes a hard, perma-link to your web site or product right on our home page. Includes a hard, perma-link to your product video right on our home page. Receive weekly emails containing leads from consumers interested in purchasing a new spa or pool. Free Inclusion Free Inclusion Free Inclusion Free Inclusion $583 / mo. You may submit one press release or news article about your company or products each month. May include a photo. You may submit one product video each month to our TV Video section. If your company has any pet-related products, and is willing to drop-ship them to customers, we will advertise them and offer them for sale on our site. If your company has any green pool or spa products, and is willing to drop-ship them to customers, we will advertise them and offer them for sale on our site. Includes a hard, perma-link and your text tag lines linked right to your web site on our Pool and Spa Message Board Forum home page (Limited Availability). $167 / mo. $625 / mo. $1250 / mo. $2000 / mo. $3500 / mo. Includes a minimum of 50,000 banner ads displayed on the top bar of our site. Includes a minimum of 250,000 banner ads and panel ads displayed on the top and side bars of our site. Also includes many other features (see below for details). Includes a minimum of 500,000 banner ads and panel ads displayed on the top and side bars of our site. Also includes many other features (see below for details). Includes a minimum of 1,000,000 banner ads and panel ads displayed on the top and side bars of our site. Also includes many other features (see below for details). Includes a minimum of 2,000,000 banner ads and panel ads displayed on the top and side bars of our site. Also includes many other features (see below for details). $6250 / mo. $8333 / mo. $42 / mo. $167 / mo. $625 / mo. Includes a minimum of 5,000,000 banner ads and panel ads displayed on the top and side bars of our site. Also includes many other features (see below for details). Includes a minimum of 10,000,000 banner ads and panel ads displayed on the top and side bars of our site. Also includes many other features (see below for details). Includes a hard, perma-link to your web site right on our Preferred Links page. Includes your company name, address, phone in BOLD in our Spa Buyer's Guide Company Directory. Includes your company name, address, phone in BOLD in our Pool Buyer's Guide Company Directory. Includes a minimum of 75,000 banner ads and panel ads displayed on the top and side bars of our site. Also includes many other features (see below for details). Includes a minimum of 150,000 banner ads and panel ads displayed on the top and side bars of our site. Also includes many other features (see below for details). Includes a minimum of 300,000 banner ads and panel ads displayed on the top and side bars of our site. Also includes many other features (see below for details). Includes your own company or product specific forum located within the Poolandspa.com Community Forum (Limited Availability). We also offer custom promotional plans from time to time, such as 'Win A Free Spa or Pool' contests and product specific promotions. Contact us for further details and availability. When compared to other forms of advertising, our rates are very inexpensive for the amount of targeted exposure you get. You can place a Banner Ad that will appear randomly at the top of our Web Pages or you can also choose a premium position Display Ad on the left hand side-bar of our Web Site. With Display ads, you also may choose the zones your ad appears in. We have zone positions and ads for all size companies. There are also a few other areas on our site where we feature paid advertising as well (see Ad-Plus and Display-It Advertising Packages below). A new Poolandspa.com TV Section has been added to our site. With the popularity of You Tube, we have had a lot of requests for pool and spa related videos to be put on our site. This is quite an undertaking, to produce and gather many videos like this, but we are currently working on the web pages. It is changing practically every day, so check back frequently for all the latest. This area is available included with most Display-It and New Product Launch advertising packages (see below). We have had a lot of request for Video Perma-links off our home page for specifically Promoted Product Videos. These spots are very limited and are $500 / month per link. This area is available as long as you get a Display-It or New Product Launch advertising package (see below). We have just updated our Poolandspa.com News section of our site to include Press Releases from the entire pool & spa industry. Check out this section for new product announcements, product info, recalls and company announcements from our entire industry the world over. This is a free service available to anyone. If you have any Press Releases, we would love to see them for possible inclusion on our site. Email your info to betty@poolandspa.com . We have had a lot of request for Perma-links off our home page for specifically Promoted Products. These spots are very limited and are $500 / month per link. This area is available as long as you get a Display-It or New Product Launch advertising packages (see below). As an advertiser, you may also be able to benefit from our Pool & Spa Email Lead Service ! As part of your advertising package with us, you will be periodically receiving pool and spa leads from us via email – usually once a week. These are folks who have indicated that they are currently own or are shopping for a pool or spa. Feel free to use any or all of these leads however you choose in your sales efforts. These are usually pretty “hot” leads – people who are about to make a buying decision. They have requested to receive information pertaining to purchasing a new pool or spa – so they are the BEST possible leads to get ! This service is available in a Basic or Deluxe Package. Some of our Display Advertising Packages include this high quality Lead Service for FREE ! Priced alone, this service is $2995. Many of our current advertisers say that this lead service ALONE is worth the price of their entire advertising package ! Some of our advertisers include: Hot Spring Spas, Sundance Spas, Office Depot, Home Depot, Caldera Spas, Premium Leisure Spas, Hot Spot Spas, Sears, Target, Eco One, Viking Pools, Coast Spas, Beachcomber Spas, Pool & Spa Living Magazine, PoolSearch.com, SpaSearch.com, Jacuzzi Premium Spas, Arctic Spas, Vita Spas, Jaguar, Saturn, Amazon.com, MGM Grand Hotel & Casino, The Luxor Hotel & Casino – as well as over 5,000 local pool an spa companies that are advertising in our Company Locator Search Engine ! We have ads for all size companies and your company will definitely benefit from running ads on our site ! We have banner ads and display ads placed strategically throughout our web site. You can generally request an area or areas (zones) where you would like your ads to appear. within a Search Result. The cost is $ 5 / month and it is billed in one payment of $60 for a 12 month listing. is billed in one payment of $120 for a 12 month listing. An active link to your web site is displayed for the whole year on our Preferred Links Page. The page is accessible from many main pages of our web site. The cost is $ 41.67/ month and it is billed in one payment of $ 500 for a 12 month listing. ( ROS – Run of Site ) for an entire year, with at least 50,000 guaranteed impressions. The cost is $ 166.67/ month and it is billed in one payment of $2000. as a Basic Listing in our Company Locator Search Engine at no charge. You will receive an active link on our Preferred Links page for a full year as well. The cost is $ 625 / month and it is billed in two payments of $ 3750.
two payments of $ 7500.
site rotation locations with at least 1,000,000 total guaranteed impressions. An Active Link is provided for all Manufacturers on our Links & Ratings page. full year as well. The cost is $ 2000 / month and it is billed quarterly. site rotation locations with at least 2,000,000 total guaranteed impressions. An Active Link is provided for all Manufacturers on our Links & Ratings page. full year as well. The cost is $ 3500 / month and it is billed monthly. site rotation locations with at least 5,000,000 total guaranteed impressions. An Active Link is provided for all Manufacturers on our Links & Ratings page. year as well. The cost is $ 6250 / month and it is billed monthly. Links page for a full year as well. The cost is $ 8333 / month and it is billed monthly. Our Hot Tub Spa Buyer’s Guide & Manufacturer’s Contact Info Directory page is the single most visited page on our web site. Every day thousands of spa shoppers log on to this page to research their options prior to purchase. On this page we include a complete directory listing of many of the spa manufacturers. Be included on this page for only $2000 for the entire year. You get a bold listing AND a link on our Preferred links page. This is truly the best value for the money for smaller sized spa manufacturers who need to get their name in front of the spa buying public – but all at a great budget price ! The cost is $2000 for the year and it is billed on one payment. If you want a larger presence on this highly read page, check out our DISPLAY IT™ Ad Packages to be included in our Recommended section as well as adding some other visibility enhancing features that are available to you. Our Swimming Pool Buyer’s Guide & Manufacturer’s Contact Info Directory page is one of the most visited pages on our web site. Every day thousands of pool shoppers log on to this page to research their options prior to purchase. On this page we include a complete directory listing of many of the pool product manufacturers. Be included on this page for only $2000 for the entire year. You get a bold listing, an active link AND a link on our Preferred links page. This is truly the best value for the money for smaller sized product manufacturers who need to get their name in front of the pool buying public – but all at a great budget price ! The cost is $2000 for the year and it is billed on one payment. If you want a larger presence on this highly read page, check out our DISPLAY IT™ Ad Packages to be included in our Recommended section as well as adding some other visibility enhancing features that are available to you. The Poolandspa.com Community Forum Message Board section of our web site has undergone a major system upgrade for 2008, giving users access to a very technologically advanced messaging system. This area of our web site is read by hundreds of pool & spa owners and buyers each and every day. Many of these people are in their final days of their buying decisions. We are now offering a very few advertisers the chance to get a hard-coded text ad for their products. To qualify for one of these highly sought after ads, you must also have a DISPLAY IT™ Ad Package of “C” or higher. Inclusion in our Forum section must be approved by our staff and space is extremely limited. Contact your Advertising Representative for further information about this program. These ads do not qualify for ad agency or multiple brand discounts and are contracted and billed separately. The cost is $7000 for the year and it is billed in two payments of $3500. We are now offering a very select few spaces on the Poolandspa.com Community Forum Message Board section of our web site for Product Specific Forums. billed separately. You must provide the Moderators for your Forum. The cost is $25,000.00 for the year and it is billed in four payments of $6250. Advertising Packages geared towards small businesses only. These great packages introduce your product to the exact customers you want to reach. product, this is a great way for your product to stand out.…or a great way to bring interested customers right to your own web site sell page. New Product Launch Ad Package - A 75,000 Guaranteed Impressions $ 2000 / 6 mo. an active link on our Preferred Links page as well. The cost is $ 4000 / yr and it is billed in two payments. link on our Preferred Links page as well. The cost is $ 8000 / yr and it is billed in four payments. Agency Rates - Advertising agencies are granted a 15% discount off rates listed above. Volume Rates -Discounts are granted to certain advertisers depending on purchase. Call for special volume discount pricing. Spa Manufacturers with multiple brands may qualify for volume discounts off rate card as follows: 100% Rate Card for first brand, 50% off for second brand, 75% off each for three or more brands. Ad Production - One time basic ad production is included in rates. Any additional work requested will be billed separately @ $150/hr. Ad Changes - Ads may be changed quarterly included in rate pricing. Any additional work requested will be billed separately @ $150/hr. Content - All ad content must be approved by us and we reserve the right to apply certain restrictions. Reporting - Advertisers are provided with their own login area of our site where they can access ad statistics in real time. Specifications - Banner Ads are 60 x 468 GIFS 12KB max. Display Ads are 100 x 100 GIFS 12KB max. No animation. If you want to learn more, you may want to look around our web site and take a look at some of the ads that are running right now. You will be able to see the various spots an ad can be placed and you’ll get a better feel as to where your company should appear. When you are ready, you should contact one of our friendly Internet Advertising Advisors so that they can help you select an advertising package that is right for your company. They understand that Internet Advertising can sometimes be confusing ( and a little bit scary at times ). They will be able to answer all your questions and explain – in plain English – what your best plan would be for consumer-direct target marketing on poolandspa.com. Give us a call and speak with one of our friendly Internet Advertising Advisors. They’ll be able to answer all your questions and put together a plan that is right for your company. We only have a limited amount of space available, so call today and request our free Internet Advertising Planner and Information Packet. Click Here to order online right now.